Hubby and I have been re-watching Lost. We got to the episode, “Whatever the Case May Be” where Shannon tells Sayid about the song lyrics Rousseau had written over and over. The song was called, “La mer”. I really liked the way Shannon sang it and decided to research the song. It was originally written by and performed by Charles Trenet. Beautiful song. After a week or so of listening to it on YouTube, I decided to buy it from iTunes. On Tuesday (7/1), Kim (CrochetKim on Ravelry) posted on the Tunisian Crochet forum about this hottest new pattern on Ravelry called La Mer. 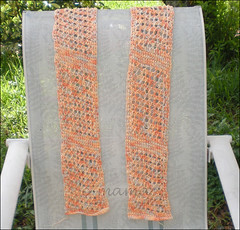 I had this scarf listed in my Ravelry queue but my queue is 3 pages long!!!! Ravelry user, knita, suggested a CAL (crochet-along) for this pattern and alce, Moderator at the forum, started the crochet-along. Yay. I picked up 2 skeins of Patons Grace in Tangelo. It’s working up nicely. I’m using a J afghan hook. The pattern calls for Fiesta La Luz Multi, a sport weight yarn made of 100% mulberry silk. But, at $30 a skein (I’d need 2), I had a difficult time justifying the expense to myself on a scarf that I probably cannot pull off wearing for myself. So, the Patons Grace, priced at a more modest $4.00 a skein, will be used. 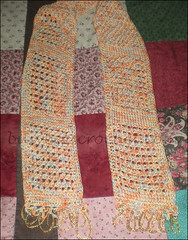 La mer scarf pattern is found in Interweave Crochet, Summer 2008 and is designed by Sheryl Means. I will probably get more Grace on Thursday and maybe take a trip to an LYS then as well. I have birthday money – whee! Finished! Got my beads (too many of them) and finished it up. 544 beads on this scarf. Nice, though. I like it.